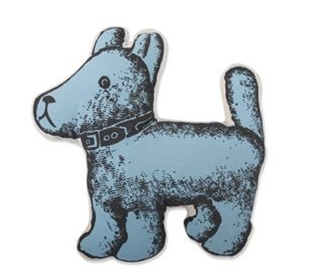 Flipping through an old issue of Modern Dog, we spotted this adorable Thomas Paul pillow. Fashioned after an antique dog toy (toy that looks like a dog... not a toy for dogs), it's the perfect pal for those that aren't ready to commit to a real four-legged friend. While this pillow can't cuddle back, it won't destroy your couch... so what are you waiting for? Adopt this pup today! Hope that helps! Pretty interesting stuff.. I think I love this.. thanks for posting this post, Very informative and well written.